This is my first attempt at a blog post so please forgive me as this is a giant learning curve for me. I don’t anticipate that I will be able to blog every day, but I start with a promise for at least attempting to blog once a week. My blogs will be about my art and those painters who have influenced me most in my life. I will share how I create my art and my greatest hope is that it will inspire you to pick up a pencil or paintbrush and “have a go” yourself. I am passionate about painting and drawing and for me being creative is like a drug. If I don’t get my daily “fix”, then I am really grumpy and I feel like there is something missing from my life. The most important thing to me about my art is the “process” of creating that art. The enjoyment for me is from just becoming totally absorbed in a drawing or painting, so that time and the place around me completely disappear into the project. Just like becoming “lost in a book” if you’re an avid reader. So I’m not great company when I’m painting! The image above is from a watercolour sketch. I am using a small A5 sketch pad of “Cachet” (180lb weight) Watercolour paper by Daler Rowney. My favourite brushes for either sketching or full sized paintings are Kolinsky (pure sable) round sizes 6 and 4 (mine are manufactured by Winsor & Newton and Da Vinci). These are my real basic brushes. If you are just starting out then go for a synthetic brush, but make sure it is from a reputable manufacturer. Winsor & Newton, Daler Rowney or the SAA (Society for All Artists) are all good. Brushes and paper are more important than paints. Although having said that my preference is for Winsor and Newton’s paints as they are always a very “creamy” texture. I have also recently been trying out a range of Russian paints called “White Nights” which have very vibrant colours, particularly good for painting flowers. I have many paintboxes. I usually use a Winsor & Newton ‘Cotman’ (student range) paintbox for my sketches and Winsor & Newton ‘Artists’ range of tube paints for my full size paintings. If you are just starting out then choose “student” ranges, as these are more economical, although they often have a smaller range of colors and they are not as “lightfast” and permanent as the “Artists” range. 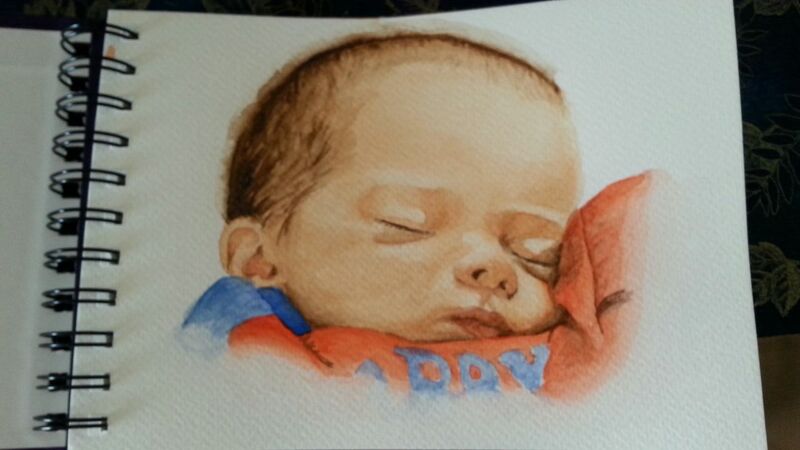 Having recently become a Grandparent for the first time I am very keen to make sketches of my young Grandson. This sketch took me about three hours to complete. I first lightly sketched the outlines using a 0.5 HP pencil. After this I think about what are the lightest and darkest parts of any image and then start with a very pale wash to clarify in my mind where each color will go. Then I gradually build up washes layer by layer, making sure that each one is dry before applying the next. My finished paintings can sometimes have seven or more layers. With sketches they will probably only have a maximum of three or less. Sketches like this are useful in deciding as to whether a particular photo or idea is worth developing into a full sized finished painting or not. As a sketch is much quicker and does not require the same investment of time as a finished painting. Well this concludes my first musings on my art and my first blog. I hope that someone out there will find it interesting….well maybe.